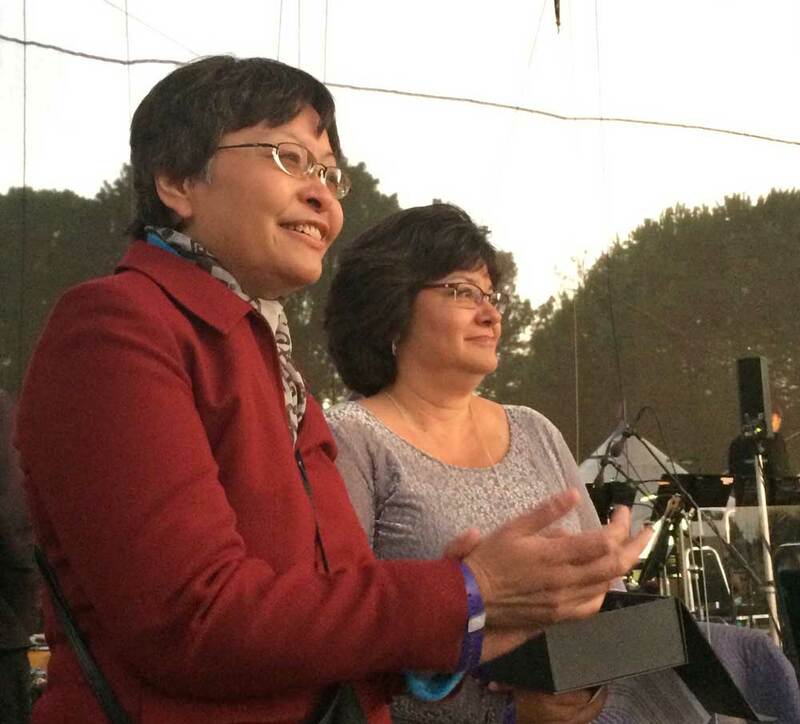 On October 3, 2015, at a live performance of symphonic Beatles Tribute “Classical Mystery Tour,” Orchestra teacher Phoebe Dong was recognized as Teacher of the Year by the Marin Symphony. Over 4,000 concert-goers, including many of her Mill Valley students and supporters, cheered Phoebe as she accepted the award, the third presented by the Marin Symphony so far. Phoebe credits her earliest musical experiences – and an unexpected gift – for her growth as a musician and a teacher. Imagine a life without music: without instruments, without lessons, without instruction. Phoebe Dong, Mill Valley Middle School’s orchestra instructor, doesn’t need to imagine such a life. She nearly lived it. The daughter of Chinese immigrants, Dong grew up in a family that loved music, but didn’t have the means to fully foster their daughter’s love of it. That twenty-five key toy was about all Dong’s parents could afford. Living in the back of a grocery store on the north side of Sacramento, the family came to the sad conclusion that a real piano would be even more luxurious than their non-existent air conditioning. But by the time she turned 6, Dong’s passion for music bloomed. Her mother took her to a screening of “My Fair Lady” and even though Dong fell asleep on her lap as the film played, she woke up the next day picking out the notes to “On the Street Where You Live” on that plinky little toy piano. Her older brother Nelson silently took note, and three years later, at Christmas, gave Dong a gift that would change her life. On the verge of matriculating at Stanford University, Nelson took all his earnings and bought his little sister a classic Spinet upright piano. That gift would forever alter the landscape of the Mill Valley School District’s music program: It launched Dong’s introduction into real music, which segued into piano lessons at age 9, and then the addition of violin through her elementary school in fourth grade. Not unlike the Kiddo! donations that provide for the MVSD’s orchestra, band, art, dance, and other programs, that Spinet might be the sole reason Dong now enjoys an eighth year in the MVSD, a tenure that comes after spending 17 years in San Rafael’s Dixie School District. Dong assures that the comparison between her gifted Spinet and the annual gift of Kiddo! dollars is not a stretch. Why the Marin Symphony awarded Dong its second School Teacher of the Year honor, the program began last year, is easy to see. Dong, a double major in music and English at Cal, has a passion for instrumental composition as well as the sharing of its beauty and importance. With the help of MVSD music teacher Lori Adessa, she also formed the MVMS Bluegrass Club last year. The extracurricular Bluegrass Club features Dong on violin, Adessa on banjo, and 21 middle school students, almost double the students of its inaugural year. The Club also books gigs, like the upcoming one on November 11, when the group opens for the Grateful Bluegrass Boys at the Sweetwater Music Hall.